TEWKSBURY, MA--(Marketwire - August 11, 2008) - Avid Technology, Inc. (NASDAQ: AVID) today announced the worldwide availability of Avid ® iNEWS® version 2.7, an upgrade to Avid's newsroom production, communication and newscast control system. With a range of new and enhanced features like iNEWS Community, the latest release is designed to streamline newsroom communication and content sharing across multiple iNEWS systems. The iNEWS Community feature enables customers to access, view, edit, monitor and search for content across various locations. Ultimately, station groups and large broadcasters will be able to identify breaking news more quickly and reduce time and costs associated with getting stories to air. "An important motivating factor to migrate to iNEWS 2.7 is seeing how the iNEWS Community feature creates new ways for our reporters to work together. Our journalists are becoming media-agnostic -- so whether the story is for the radio, television or Web, we need to turn content around quickly and reliably," said Marie Josée Drouin, senior application manager for CBC/Radio-Canada. "The new content sharing capabilities will enable us to take full advantage of all broadcast stories within our four systems, and eventually enable us to change the way we handle things by integrating all of the tools used by journalists. The beta tests concluded that the implementation of iNEWS 2.7 could present an excellent opportunity for our editorial teams to redefine how they segment the newsroom and improve the overall functionality of their daily tasks." iNEWS 2.7 -- What's New? Previously, broadcast professionals could only access media on their local iNEWS system, which hindered the ability to receive pertinent and timely story content from other news teams in the organization. The iNEWS Community feature eliminates these communication barriers by allowing news teams to drag and drop stories directly between systems, easily access and duplicate stories from other iNEWS systems, and build shortcuts to remote locations. These new features ensure that journalists remain at the forefront of news when it happens, minimizing delays and costs associated with producing stories for broadcast mediums. 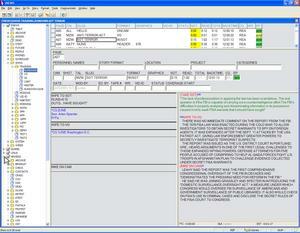 Avid iNEWS 2.7 is available now. Upgrades are available for customers with valid Customer Support contracts. For more information, please visit Avid iNEWS. Contact your local Avid salesperson or reseller for additional pricing configurations. Avid is a worldwide leader in tools for film, video, audio, 3D animation, gaming and broadcast professionals -- as well as for home audio and video enthusiasts. Avid professional and consumer brands include Avid, Digidesign®, M-Audio®, Pinnacle Systems®, Sibelius®, Softimage® and Sundance Digital®. The vast majority of primetime television shows, feature films, commercials and chart-topping music hits are made using one or more Avid products. Whether used by seasoned professionals or beginning students, Avid's products and services enable customers to work more efficiently, productively and creatively. Avid received an Oscar® statuette representing the 1998 Scientific and Technical Award for the concept, design, and engineering of the Avid Film Composer® system for motion picture editing. For more information about the company's Oscar, Grammy® and Emmy® award-winning products and services, visit www.avid.com, Buzz, del.icio.us, Flickr and twitter; or connect with Avid on Facebook. © 2008 Avid Technology, Inc. All rights reserved. Product features, specifications, system requirements and availability are subject to change without notice. Promotions and discounts are subject to availability and change without notice. Contact your local Avid reseller for prices outside the U.S. and Canada. Avid, Digidesign, Film Composer, M-Audio, iNEWS, Pinnacle Systems, Sibelius, Softimage, and Sundance Digital are either registered trademarks or trademarks of Avid Technology, Inc. or its subsidiaries in the United States and/or other countries. Emmy is a registered trademark of ATAS/NATAS. Oscar is a trademark and service mark of the Academy of Motion Picture Arts and Sciences. Grammy is a trademark of the National Academy of Recording Arts and Sciences, Inc. All other trademarks contained herein are the property of their respective owners. With the iNEWS 2.7 Community feature, journalists have easy and instant access to stories and content on other iNEWS servers from their local interface.